Good Monday morning, internet friends! I'm elbow deep in projects for the new issue of Alphabet Glue over here, while also attempting to manage things like remembering to send the order envelope for school pictures, finding the pilot for the toy airplane, and making sure that everyone is starting their week with clean socks. Well, maybe not everyone. I like you, but you are on your own. I did want to mention this pretty great new e-book bundle sale that I am participating in this week, however. It is organized by Mindful Nurturing and is entirely play-oriented. The bundle contains 10 quality e-resources for kids ages 1 to 12, plus 3 bonus resources. There's a little something for everyone: coloring pages, a yoga story book, mandala drawing initiation, treasure baskets and sensory bins, modeling play, and much more. 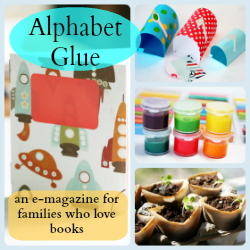 And, of course there are issues of Alphabet Glue included. You'll find both Volumes Nine and Fourteen in the bundle- the two most recent early autumn themed issues. You can read more about the resources here, and then get your bundle today for only $14.95, (over 80% off a retail value of $79). It's available only until October 3! Well, I suppose we didn't actually go much of anywhere. I mean, not so much that it then seems necessary to use a such dramatic title for this post. There were day trips, yes. And there were more forays out onto local beaches for purposes of making sand castles and searching for particularly nice little sea shells. But mostly we have been here, having our summer behind the scenes. But come tomorrow morning, summer officially comes to a close. In the vacation sense of the word anyway. The big kid begins her new school year. She's got a reasonably new pair of pink kicks with matching laces and, thanks to a weekend shopping trip with grandma, some new socks to match. We are ready. Ready, I might add, to begin the fourth grade year. Yep. Fourth grade. I would wax philosophical about that one a bit if I were even the least bit capable of coming up with words to explain how I feel about my tiny little girl waking up one morning as a fourth grader. But, no such words are available just right now. And while his big sister is off all day doing what fourth graders do, baby Z. and I will settle into a new routine of our own. It has been months since we had days without Mariam around the house, and I expect that at first he will miss her a not inconsiderable amount. But he will probably nap a bit better as well, and that will mean that I can resume my regularly scheduled posting here. Which is to say, my posting that follows no schedule or organized theme whatsoever, but is at least somewhat more frequent than these summer months of slack have led you to expect. In other words, I'll be seeing you again soon. And then I'll be seeing you a little more often too. In the meantime, I totally forgot to mention here that I have been running an Alphabet Glue back to school sale for the last week or two. Um, sorry? But since this is the first you have likely heard of it, I'll extend it a bit. Enter "school" at checkout between now and September 9th for 20% off all issues. Alphabet Glue: Say Hello to Volume Fourteen! Well. I will be the first to admit that I wasn't sure that I was going to pull it off this time. Oh, I planned out this newest installment of Alphabet Glue on paper weeks and weeks ago. I knew, for the most part, what was going into those pages, and I was excited to get it all written up and out into the world for you to see. But then there was a month of my husband working 90 hour weeks and the baby getting four teeth at once and me getting really distracted by things like the beach. We've discussed this. So, I got a little behind. But I am happy to report that thanks to helpful family and a couple of bags of tortilla chips, I made it. And on time, too! Volume Fourteen of Alphabet Glue is now officially available for you and yours, and there is a whole lot of fun stuff inside. If you already know that you are all in, just click the button below to grab a copy. If you'd like to read up a bit more on what is inside, hop on over to the Alphabet Glue website and take a look around.